The recommendation of a barracuda recruiter can go a long way toward expediting and locking in the interview you want. However, you’ll also need the right qualifications and a dynamite resume in order enhance your odds of getting the job you want. In today’s competitive employment market, your resume has to quickly stand out in order to get the attention of the decision maker and create a strong impression. And later on, when you meet the prospective employer face to face, a strong resume will act as a valuable tool during the interviewing process. Although there’s no federal regulatory agency like the FDA or FCC to act as a watchdog, I consider it to be ethical common sense to honestly and clearly document credentials. In other words, don’t make exaggerated claims about your past. 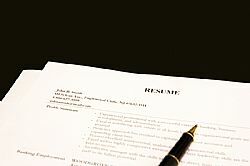 At the same time, we provide our resume tips and templates to encourage and help you to not undersell yourself either. A. How do you present yourself to others? B. What have you done in the past? C. And what are you likely to accomplish in the future?